Perched high above the coastline of the French Riviera, Eze is a jewel of a medieval walled city, captured in time, and well worth visiting while on a crewed yacht charter along the Cote d’Azur. 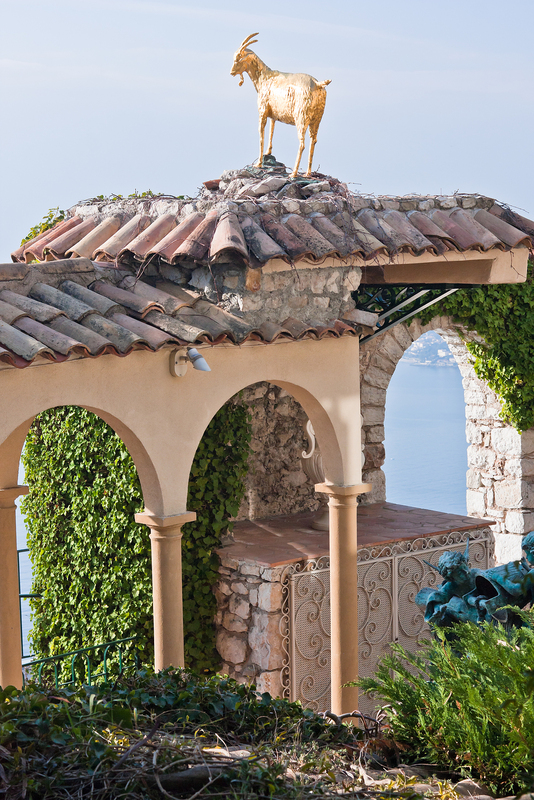 Often referred to as an “eagle’s nest”, Eze sits approximately 437 meters above sea level overlooking long lengths of the chic coastline far below. Today Eze is a bustling little village inside the medieval walls, with twisting alleyways full of steps winding up to the top of the town that are filled with little shops, boutiques and restaurants. Anchor at nearby Cap Ferrat for a short inland drive to a car park at the foot of the city, and walk into the fortified town to wander and explore this little medieval time capsule while on a crewed yacht charter along the French Riviera. As a natural defensive location overlooking the coastline and harbors of Nice and Cannes, the Eze area has been inhabited by various civilizations since 2000 BC. 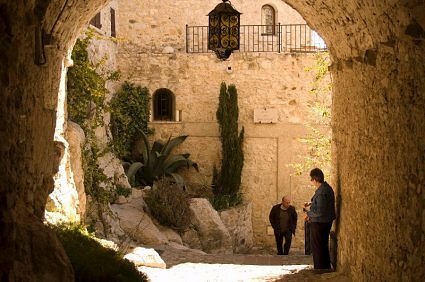 It was in the late 1300’s that the House of Savoy built the fortifications creating the walled city that is the Eze of today. 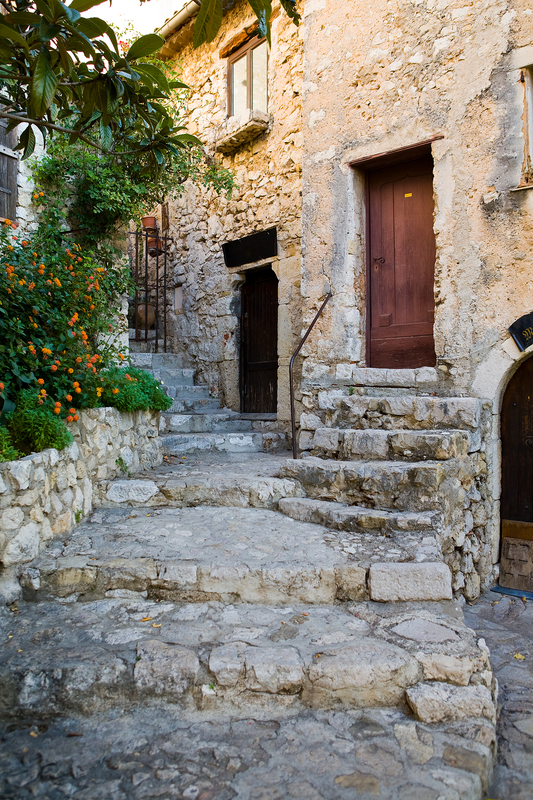 In 1860, the people of Eze voted for the city to become a part of France. 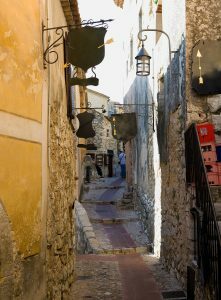 Now thought of as a “museum village”, Eze is one of thirteen villages in France grouped together to form the Route des Villages Perches (Route of the Perched Villages). 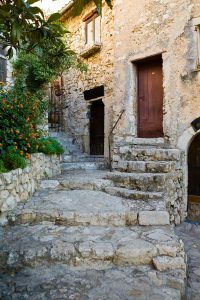 Looking up from the coast, Eze can be spotted in the hills by sighting the light ochre colored church sitting within the walls named the Notre Dame de ‘l Assumption which was built in 1764. Eze is a walking village, as all cars are left outside the walled city in a car park at the bottom of the final peak upon which the city was built. Visitors walk up the path to the walled city gates to enter and wander along the cobblestoned alleyways with the multitude of steps that wind up and down the hilltop inside the walls. At one of the highest points inside Eze is the Chevre d’Or hotel and restaurant. The restaurant is well worth stopping in for a meal (reservations a must), as the food is outstanding and the view extraordinary. Once a bustling little city, today Eze is a true jewel of an example of a medieval walled city known both for the beauty and charm of the cobbled walking streets and stone buildings and for the great views. Inside what was a working city built for defense are now various shops, art galleries, boutiques, restaurants and hotels including a sales outlet of the nearby Fragonard Perfume Factory. It is easy to spend an afternoon wandering and exploring inside the walls of Eze and staying for dinner to enjoy the outstanding view overlooking the Cote D’Azur while on a crewed yacht charter along the French Riviera.